This string has so much leverage. As a 5th grade teacher using a string such as this one reinforces the building blocks of concepts such as multiplying fractions, multiplying decimals, which at first seem like scary terrain for students. The students approach this string with confidence in their mental math and social knowledge, which makes it a powerful reminder when they are faced with concepts that they perceive as ‘hard’ or ‘new’. The use of the word, of, as opposed to the multiplication symbol is crucial for transfer work when multiplying fractions. What wording to people use to help students see “of” as multiplication? Over several years of teaching multiplication strings with fractions I’ve found that some groups follow me right away to use “of” and “times” interchangeably, while others refuse to be convinced of the connection. 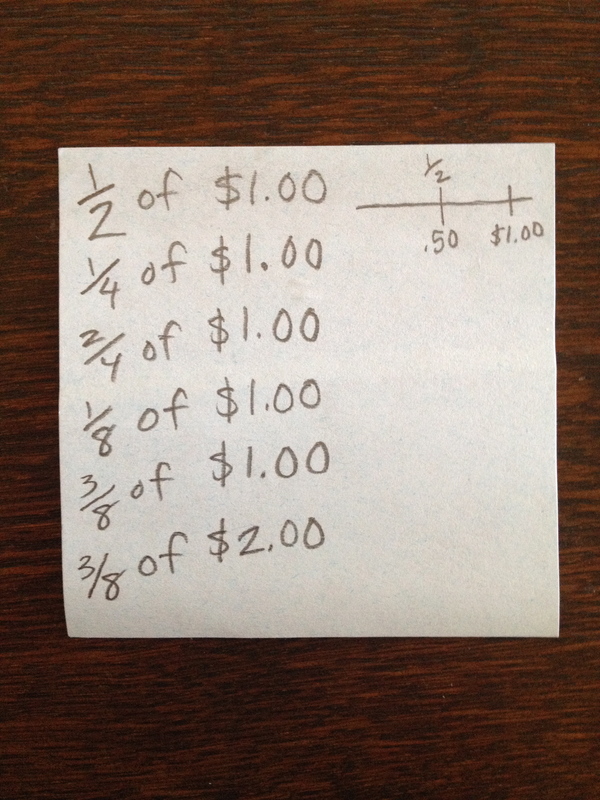 1/4 of $2.00 is intuitive to them, but writing that concept as multiplication is not. Anyone have some good stock phrases? Would the kids think of these last ones as “groups of” or “of” or would they use the more generalized multiplication? Would playing with the commutative property help them rearrange the multiplication (first do 1/2 times 2)? I think that representation (as always) would matter quite a bit. I can see the string represented on both a number line and some objects in sets, maybe also an array. The multiple models might help here.